One of the minds behind Warhammer Online envisions a future where subscription-based MMOs keep out the riffraff. MMOs just can't get people to subscribe anymore. From Age of Empires Online to DC Universe Online to the mighty World of Warcraft, every MMO seems to be embracing a free-to-play model. 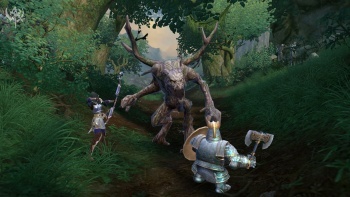 At least one MMO veteran is unwilling to give up the idea of subscription fees, however. Mark Jacobs, former CEO of Mythic Entertainment, believes that the market will swing back towards subscription fees. These fees, he argues, will allow developers to produce more innovative games with fewer disruptive players. "[The] problem with free-to-play is that a lot of the time the games are crap," says Jacobs. "I think some players are starting to get tired of it. They're willing to pay a little bit more. Are they willing to pay $5 a month? $10 a month? $20 a month? I don't know yet but I think we will see a shift from free-to-play back to a model where it isn't one size fits all." Jacobs goes on to say that a free-to-play environment encourages players to engage in griefing behavior without penalty, and that subscription-based games will have to offer more than polished WoW clones. "Innovation is difficult and sometimes innovation doesn't work. But to come into this space now with a very high-priced WOW game would just be tough." Jacobs believes that the subscription figures for EA's upcoming Star Wars MMO The Old Republic may prove to be either a death knell or a renaissance for subscription-based games. "If EA is right and it's successful then other publishers or developers will look at the space and go 'see, you can make money selling subscriptions,'" he explains. "And if it doesn't do well, that would be an argument for saying that free-to-play really is dominant." Jacobs may possess the minority opinion right now, but keep in mind, this is the guy behind both Dark Age of Camelot and Warhammer Online. He's been in the MMO market for a long time, and seen both massive successes and failures. Come December and The Old Republic, Adam Smith's invisible hand will decide whether the subscription model is still viable. As Jacobs pointed out, "It will be an interesting few months."